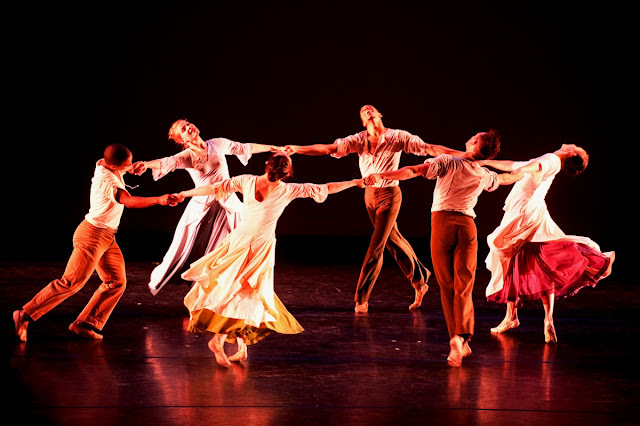 Credit the Limón Dance Company, and its artistic director Carla Maxwell, for the ambitious José Limón International Dance Festival now at the Joyce, which features work by Limón danced by his company plus a number of guest artists from around the world, including the Royal Danish Ballet. By “subcontracting” the repertory, we have the chance to see far more than the native company could prepare for one run at the Joyce, where it has annual presentations. It does, however, raise a question about quality control that many choreographers face when their dances are done outside their company's orbit. Merce Cunningham Dance Company closed in the wake of its founder's death, in part to avoid this situation (although some dances are set on other company's by authorized artists, much like the Balanchine Foundation). Program C at the Joyce led off with sjDANCEco (San José) in Mazurkas (1958), with live Chopin piano music. It was immediately apparent that these dancers were not as polished as the Limón Company, even if they possessed youthful energy. The bright yellow and blue costumes, with ribbon trim and bunching seams, didn’t help, and the close proximity magnified any problems. But the sunny, romantic mood of the piece raised the spirit, and the dancers rode and leapt on and over the lively rhythms. Once the Limón Company took the stage in Carlota (1972), an incisive political and psychological drama, the gap in technique and depth became even more apparent. This recounting of an episode in Mexico’s mid-19th century political history began with a hair-raising scream in the dark, followed by “Maximilian!.” The initial scene showed a couple—the Empress (Brenna Monroe-Cook) cowering in a thick grey cape, while the Emperor (Ross Katen) coaxed her into action (presumably it showed her waking from this terrible memory). They relished their privileged standing among the fawning court, at least until reformist President Benito Juarez (Mark Willis, razor sharp) in a dark suit, commanded his militia to arrest, and execute, the emperor for war crimes. Stomps and body slaps from the strident moves created the effective musicless score. The company's assured delivery and effortless confidence were a master class in the style. There Is a Time (1956), to Norman Dello Joio’s score, was performed by American Repertory Ballet (Princeton, NJ). This lengthy, work comprises many sections that depict various emotional states of youth. Its lucid opening structure—the 15 dancers form a circle, which collapses and expands—is retraced toward the end, after each small grouping or soloist performed a passage with a signature movement, all of which were thrown together in the penultimate section. While a few sections too long, it serves as a good primer for Limón’s archetypal vocabulary, alternately organically flowing and geometrically crystalline. Back to the question of the authenticity of the style... if it can't be done properly, is it worth allowing it to be performed? You might think that Limón's relatively naturalistic style would lend itself to this, but this side-by-side juxtaposition actually underscored the varying quality of his choreography's renditions. The takeaway: Limón's own company looked fantastic, and his repertory, performed by other companies, still felt relevant, if underserved by the lack of training and consistent quality.